I was born on May 1, 1976 into a believers’ family in India. Though, I was brought up in Christian teachings, I went after the worldly pleasures as I grew older. But to my dismay I did not find the joy and peace that I really wanted. One day, a man of God came to our home and shared the Good News. While he was sharing, the Holy Spirit cleared my certain doubts that I was carrying in my heart for long. That day I chose to completely trust in Jesus Christ. After this change in my life, I was opposed in my village for my faith. In those days, God strengthened me to stand firm in His love. I spent time in prayer and studying the Word. I was encouraged, feeling God’s hand at work in my life as I was being renewed in spirit and mind according to the Word. As I was growing in the wisdom of the Word, God showed me clearly that He was calling me to share the love of Jesus to those whohave not yet heard. 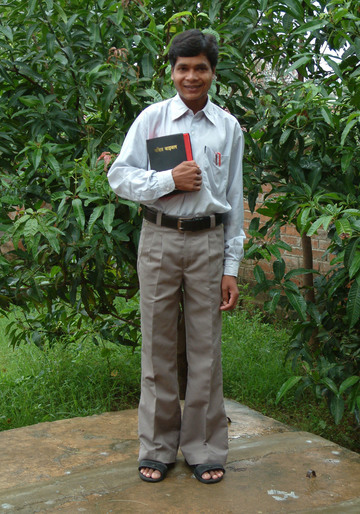 Responding to the divine summons, I enrolled in a Bible school.